My main interest is in propagation and in particular chip sounders. See the September '93 issue of Popular Communications article "Monitoring the World's ionosounds" by Andrew W. Clegg. This is about the BR Communications (now part of TCI/BR in Sunnyvale, CA) chirp sounders. Another aspect of High Frequency listening is called utility stations, these are all stations other than commercial broadcasters. A huge list of radio related web links. Spy numbers stations have been around for many decades with all kinds of speculation about what they are doing. The Spooks Newsletter has some remarks on the numbers stations as well as military related utility stations. Note that on one of the audio recordings of a numbers station you can hear tones in the background. This may indicate that the voice is a cover to allow tuning to the frequency, but the real communication is taking place using a modulation scheme that can not be heard on a conventional radio (like with a GRA-71 code burst transmission). I currently have an old McKay Dymec DR33 (Photo) (review). 541-751-0108 This is a mid nineteen seventies vintage digital tuning receiver that is built with standard components, no ASIC or custom circuits. It has a knob for tuning each of the frequency digits and is therefore good for following the chip sounders. My dream receiver was the WJ HF-1000 or one of the military versions in theWJ 8712 series. These Watkins Johnson receivers use Digital Signal Processing (DSP) to do the IF filtering and signal demodulation. They are capable of hearing signals that are very weak and undetectable with conventional analog type receivers and can be controlled by a remote computer. Japan Radio Corporation is introducing it's NRD-545. This receiver uses DSP for IF filtering like the HF-1000 but has an 18 bit A/D converter instead of a 16 bit converter adding some dynamic range. It also has a DSP IF filter with variable bandwidth. There is an optional CHE-199 card that increases the frequency coverage to 2 GHz. It is interesting that Robert B Fenwick was involved with the BR Communications chirp sounder equipment and his brother Richard C. Fenwick working at Electrospace Systems in TX developed the time delay antenna system mentioned below. Raytheon Systems Canada Ltd., a subsidiary of Raytheon Company HF SWR-503 - shore-based, long-range HF Surface Wave Radar "Buzzer"
Ten-Tec 1064 Smart Squelch can be added to receivers that don't have built in squelch, works on audio signal so you don't need to get into the agc circuit. One of the lessons learned after the start of W.W.II was that it took a week or two for some U.S. military commands to get the word that we were at war through the normal chain of command. To fix this the EAM system was implemented. Now EAMs are used for the control of Nuclear forces. In most cases EAMs are short encrypted messages that are passed using many different types of communications networks such as voice and digital. When the nuclear weapons were removed from our strategic bombers an EAM with that directive was sent in the clear. These are often confused with numbers stations. in the movie Crimson Tide EAMs paly a key role as does LF and VLF radio coms. Now that I have the NRD-545 I am finding a lot of AM and FM stations that just were not heard prior to this. Lowe Technical Review of the NRD-545 - Lowe also carries the HF-1000 and in this review "...very best HF receiver I've ever had the pleasure of using..."
For information on real antennas see my Antenna web page. The "Beam and null switch step steerable antenna system" U.S. patent 4063250 by Richard C. Fenwick is a great explanation of time delay beam steering. The "phased array" antenna is a special case of the time delay steered antenna. Note that in the time delay steered array the direction of the maximum lobe is frequency independent whereas in the phased array it is a direct function of frequency. Fenwick also patented a "Three band monopole antenna" 4145693 that was sold with the beam steering network by "Omega-T". I have seen references that say a loop antenna will work as well in a forest as on open ground. Since I am in a forest this needs more research. A Wide-Aperture HF Direction-Finder With Sleeve Antennas - NRL Memorandum Report 843 -Unclassified (was Confidential) 20 Aug. 1958. Describes a 434 foot diameter array of 40 equally spaced sleeve antennas on a wire mesh ground 600 feet in diameter and 580 ground radials over 1,000 feet long. The array was complete just in time to track Sputnik on 20.005 Mc. This showed the need for a grounded screen inside the active antennas. It was added 16.5 feet back or on a 200 foot radius. Once the ground screen is added the name changes from Wullenweber to Elephant cage (maybe both are correct?). This system was used with a Goinonmeter that used a printed circuit to capactivitly couple the signal. It was motor driven. They also used delay lines (see the above patent) to form 40 separate beams that were fixed. US3564551 02/16/1971 Dipole Antenna with Electrically Tuned Ferrite Sleeve = CCD see Oct. 78, "73"
US3984834 Diagonally fed electric microstrip dipole ant - U.S. Navy, used by Trimble for AN/PSN-10 GPS ant. In part 15 of the FCC rules there is a provision for unlicensed operation in a number of frequency bands. One of these is 160 - 190 kHz. You are allowed a total feed plus antenna length of 15 meters (about 50 feet) and an input power of 1 Watt. I used a Palomar® Engineers longwave transmitter kit that used an adjustable powered iron core in a Lotz wire coil and AFAICR an IRF-510. Since a high-Q antenna circuit is required the bandwidth limits the mode to very narrow band modes such as CW or narrow band digital modes. The Longwave Club of America is for "Lowfers". In order to get good results you need a high-Q coil. In order to learn about the subject of high-Q coils I spent a couple of years finding and reading out of print books about inductors and got a Boonton Model 160 Q-meter and did a great many experiments. An interesting idea is to use a frequency converter like the Palomar to translate the lower frequencies up to 3.5 or 4.0 MHz (for zero frequency) and then use the NRD-545 receiver to take advantage of it's 10 Hz DSP based IF filter. This should allow the reception of signals that would otherwise be buried in the noise present in the much wider IF bandwidths of conventional receivers. Need to try this. GWEN - These sites are going to be converted to GPS differential correction sites to serve the land mass of the CONUS. Kiwa - Earth Monitor - 10 Hz to 15 kHz. In the process of studding antennas and low frequency techniques I came across Nikola Tesla. He was a brilliant inventor. When he went to the U.S. patent office and applied for a single patent on an A.C. power generating and distribution system it was rejected and he was told to break it down into over a hundred separate patents. In "The Colorado Springs Notebook" it can be seen that he shows photographs of all of what he was doing PRIOR to getting the antenna into a high-Q resonance mode of operation. He did this by top loading the antenna and using a small coil to tune the antenna. AFTER this he did not show photographs of the complete system. He had discovered high-Q resonance but did not understand it. Note that most "high school Tesla Coils" do not have enough capactive loading to get the Q up and are therefore just high voltage transformers operating at a Q near 1. A coil operating at self resonance has a Q of 1. To get high Q values the loading capacitance must be much larger than the self capacitance of the coil. Today there is much pseudo science associated with Tesla's name, but what Tesla did is amazing. The one I remembered had to do with minimizing the cost of the copper and iron used in generators and motors. As the frequency goes higher less magnetic material is needed in a motor, generator or transformer. Note that aircraft A.C. systems are typically 400 cycles per second. This allows the dynomotors and transformers to use less iron and be lighter in weight. But as the frequency gets higher skin depth limits the effective current carrying capacity of a copper wire. Tesla used Litz wire in his coils at Colorado springs to get around this problem with operating frequencies in the hundreds of kc range. One said the frequency needed to be high enough to avoid flicker in electric lights. Note that movies run at 18 and 24 frames per second and don't flicker. A TV set uses 60 interlaced fields per second instead of a simple 30 frames per second to avoid flicker. So this seems like a consideration. One said that large generators of the time could only turn in the hundreds of revolutions per second so there was some limit, but I think the frequency can be higher than the RPM of the generator. But as the frequency gets higher there are phase delays associated with the inductance of the distribution grid. This may relate to two points on the grid being connected together even though they are different distances from the generator. It occurs to me that in applications where there are large amounts of power being transferred, like in electric trains, that the frequency is moved down to around 16 Hz. This allows copper wires to carry larger currents. The iron core weight penalty is much easier to take than the expense of Litz wire. If the skin depth is 8.57 mm for copper wire at 60 Hz then a wire twice this diameter or 0.675" dia is the largest single conductor that can efficiently carry 60 Hz power, if it's larger you're wasting copper. The common tables only go to OOOO gauge wire (0.46" dia) which makes sense since you don't want to be using a single conductor at 60 Hz much larger than that. It also appears that Westinghouse had an A.C. power system consisting of a generator, transformers and street lights prior to Tesla. His system was more efficient than the Edison G.E. system of D.C. powered lights, but was lacking an A.C. motor. Nikola Tesla Page - This page seems to have all the Tesla links you could want. This is THE patent for wireless communiction although most of it is framed for energy transmission. You can learn a lot about what is going on in your community by listening to a scanner radio. It also can by used as a lab instrument if it has remote programming capability as does the ICOMR7000 (Photo). I have added an AGC DC output that I can read with my HP 34401 DMM by means of a LabVIEW and convert into input power in dBm. The program also controls the frequency and mode of the R7000. Optoelectronics - Patent US5471402: Frequency counter - shown in ad for counter that sets freq of scanner. When I was a boy a number of relatives gave me "Crystal Set Kits". A few years ago after learning about coils I made my own crystal set that could pick up about two dozen stations and the powerful ones could drive an antique horn speaker to room volume. I spent a couple of years winding coils and testing them on a Boonton 160. Q is the Quality of an inductor and is the ratio of the inductave reactance to the resistance (XL / R). There are a number of components to the resistance. DC resistance of the wire depends on the gauge and length. AC resistance is effected by skin effect, as the frequency gets highter the resistance goes up in a linear manner. When winding a milti-turn coil (1) that's a single layer, like on a Quaker Oats box spacing the turns about 1 wire diameter works very well where there's an air gap between turns. But if you wind a coil where the conductor diameter is the same as the above coil but achieve the spacing by using the insulation the coil will have a much higher self capacitance. In the above case if you wind two layers (coil 2) , the first left to right and the second right to left the self capacitance is very high. This is because the effective capacitance depends of both the voltage difference between any two turns and the mechanical capacitance between those same two turns. In the case of coil 1 the voltage between all adjacent turns is just V/(n-1) where n is the number of turns. But in the case of coil 2 the voltage between the left top turn and the left bottom turn is all of V so it's self capacitance is very high. You can get around this by bank winding the coil. For example winding two turns on layer one, then one turn on top then one turn on the bottom etc. This keeps the voltage across adjacent turns down. All of the above is very important since a coil operating at it's self resonant frequency has a Q of 1, no matter how it was made. (This is something that 99.99% of the Tesla coil builders don't get.) So in order to get high Q you need to load the coil with a capacitance that's substantially larger than the self capacitance. You can see the it's very important to not only wind the coil in such a way that the HF resistance is minimized but also in such a way that the self resonant frequency is as high as possible. PVC is not a good coil form because of this. The best forms come as close to looking like air as possible. In order to determine where the coil losses are coming from you can plot the Q vs. frequency and look at the slope. This way you can see the difference between DC resistance (zero slope), skin effect (linear slope), dielectric loss (f^2 slope). If I remember correctly when you differentiate Wheeleres equation it comes out that when D is about 2.54 times the length you get the most inductance for a given wire length on a lingle layer coil like (1) above. But most coil plans and the ones that came with crystal raios kits (I built many of these) got it backwards and the coils were about 2.5 times longer than the diameter (i.e. more like a toilet paper roll). There is a Xtal Set Society that publishes a newsletter and some books on crystal sets. 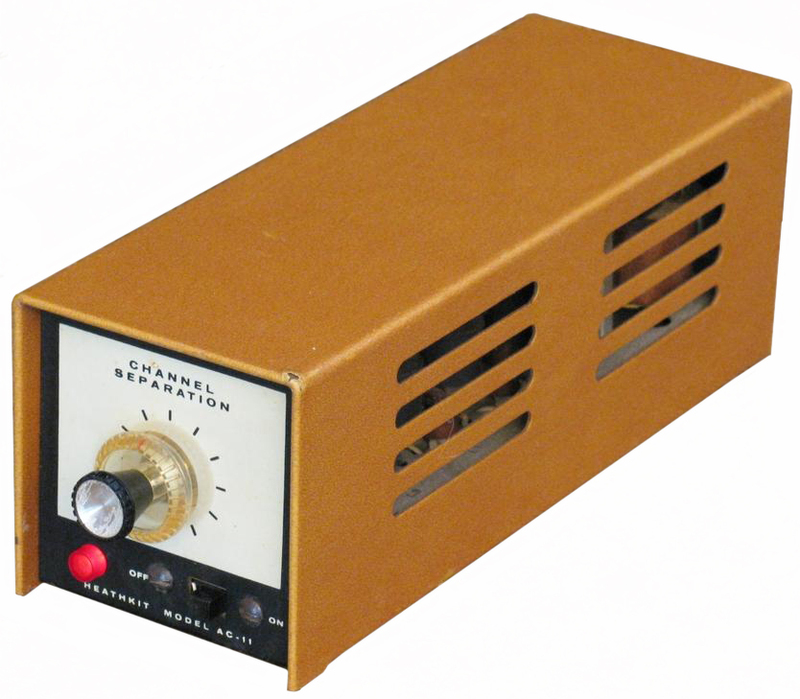 Amateur Electronics Supply has Crystal Radio Kits. Home Made Crystal Radio circa 1800? - very simple circuit diagram and "Foote Phila." crystal holder. Heathkit had a number of "Hi Fi" components and one of them was the combined AM/FM tuner (AJ-30?) and matching (AA-100) audio power amplifier (all tube equipment). There were also a pair of stereo speakers. Records and tape (Magnacord 1024 Reel to Reel) were in stereo. But the only off air stereo was when you tuned to K101 on the FM dial and at the same time you would tune to the simulcast AM station that was owned by K101, so AM for one channel and FM for the other channel. That was soon replaced with multiplex FM where tuning to just one FM station and using the AC-11 Stereo Adapter would allow hearing Hi Fi stereo. Note with the AM + FM method, the AM channel was far from "Hi Fi". This adapter locks on the pilot tone and decodes the L+R (conventional mono output) and L-R (not heard on normal receivers) channels then using a matrix outputs L and R signals. When Video tape copy protection came about this box could be modified so that it would lock on the pilot tone and decode the horizontal sync pulse (in the L-R channel) that was being messed with for copy protection. I have an old technician class license that only allows CW operation in the HF bands, not digital modes. In my opinion the morse code requirement is way out of date. The maritime CW distress frequency of 500 kHz has now been decommissioned as being obsolete, but the rules for a amateur radio license still require morse code to use the HF frequencies. I occasionally use 2 meter radios for voice and digital modes. The ARRL and the FCC propose to restructure the amateur radio licenses so that more people can use HF voice WITHOUT passing a code test. Amateur Restructuring is Here: Three License Classes, One Code Speed - all code is now 5 wpm! I have had an interest in computers since grade school when only mainframe machines existed. My MSEE courses included all the computer classes that San Jose State had to offer. Also see my Rack and Stack Systemspage for HP Rocky Mountain Basic Workstations. See my separate page for Personal Digital Assistants, hand size computers. I have not yet got one of these, but they are interesting. My interest would be connecting the PDA to other equipment like GPS, camera, radio, sensors, etc. Starting with a SWTP Motorola 6800 microprocessor based system that came with no software and a wallet programming card I learned how to write directly in hex and later in assembly code. This computer always had the cover off because I was connecting some new I/O card or other hardware to it. In the end I had the luxury of two double sided 8" floppy disks and a TI 132 column character printer and a Lear Sigler "glass TTY" terminal. The Motorola 6800, 6809, 68000 series of chips was way ahead of the Intel chips in their elegant instruction set and in their capability. The story I heard is that Motorola when asked by IBM to supply chips for their "PC" said that they were already too busy building chips for all the GM cars so IBM ended up with Intel chips. At the "Home Brew Computer Club" that met at the SLAC auditorium I got the TTY paper tapes with the Motorola assembler and editor. Later Tom Ptiman used these to write a version of "Tiny Basic" based on an article in Dr. Dobbs Journal. In exchange for the use of my equipment, I got a copy of Tiny basic. Later Tom worked with AMD to make a microcontroller with Tiny Basic as it's operating language. One of the key things about the Motorola 6800 (& newer chips) is that you can write relocatable code. That means that a code module will run if placed in a memory location other than that where it was written. Reusable, Recursive, Relocatable are all very desirable features of software. I soon replaced the Motorola BIOS ROM chip with one from Microware that contained a Real Time Operation system. This was possible with Motorola chips but not with Intel chips because of the RRR power of the Motorola chips. This is the reason that the Apple and HP workstations computers were more capable than the Intel based machines. This was based on the Motoroa 6809. There was an application note that had the circuit diagram. It used a standard NTCS monitor or TV as the display device. I have the 4 slot expansion accessory and a number third party boards. The operation system that is stored in ROM is copied into RAM and run from the RAM. This allows other operating systems to be used. I used OS-9 by Microware. I got this at my local Staples office supply store. Since I am in the Wine country there is not a local Fry's store and I like the ability of being able to get local support. The good thing about this computer is that the case is very easy to open to insert cards. The bad thing is the lack of any technical documentation. Feb 2004 - Main computer was built to order. Large tower case. 2.4 GHz Pentium CPU. Removable hard drives. Motherboard supports serial hard drives, but have not yet installed them. Sony DRU-540 DVD/CD-ROM burner. I choose this model because it has an IEEE-1394 "Firewire" interface that has the potintial to control a Hard Disk Drive Head test system. None of these companies have an adapter for the Sony VAIO Z505SX, which is the one I have. Now my interest is in the Microchip PIC series of Microcontrolers. These are very capable chips at low cost. I prefer to use their native assembly language although a friend likes the pseudo Intel commands that the Paralax compiler supports. 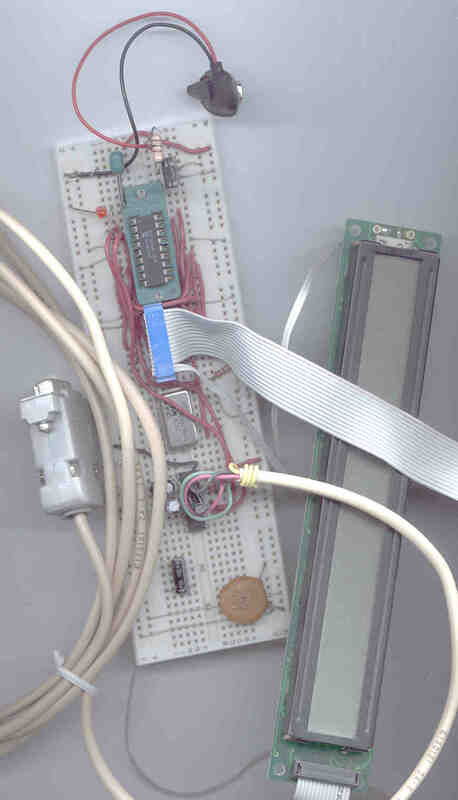 There are two kinds of user programmable micro controllers: (1) the classical EPROM type that has a quartz window so that it can be erased by using a UV lamp, and, (2) then newer EEPROM "flash" type that is in a conventional epoxy or ceramic package, these are electrically erased and are much easier to use. This is the reason for the popularity of the 16F84 series. I have a project on the back burner to use a PIC to control an oscillator based on the timing signals from the Motorola VP+ GPS receiver. 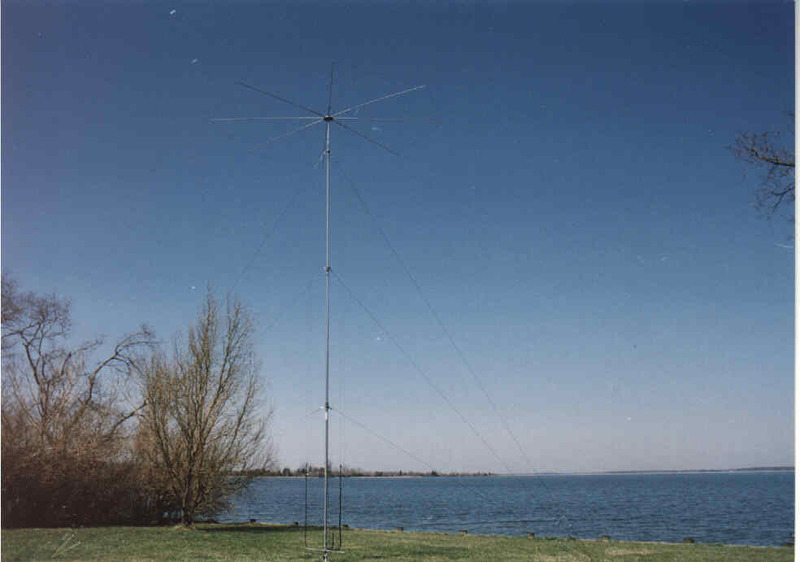 This is similar to the project by Brooks Shera W5OJM that appeared in the July '98 issue of QST Amateur Radio magazine. Hardware to read Motorola binary data and display date, day of week and time on LCD. The LCD was surplus, maybe because the 14 pin header was installed on the wrong side of the PCB, easy to fix. Nov 2002 - Have started to work with PICs after a few years away. There are some very interesting new developments. The 16F84 is in an 18 pin package and has 13 I/O pins the newer 16F628 is also in an 18 pin package but has 16 I/O lines. See the Table of package pins and I/O pins for just some of the PICs available as of Nov 2002. Note that the 16F876 has more memory than the 16F873 than the 16F870 but otherwise they are very similar. hardware handshaking on the RS-232 port so that needs 4 pins (TxD, RxD, RTS, CTS). In In Circuit Debugger 2 has the ability to HV program the chip (uses 5 wires on a 6P6C modular telephone type jack) This looks very similar to conventional In Circuit HV programming except now there is a standardized modular connector rather than no standard. Of course for those chips that have the internal debug hardware this also works for In Circuit Debugging. The version 2 ICD rquires the use of MPLAB 6.x and a USB port for the fastest transfers. PICList home page - the digest no longer shows all the messages, too bad. More information on LISTSERV commands can be found in the LISTSERV reference card, which you can retrieve by sending an "INFO REFCARD" command to LISTSERV@MITVMA.MIT.EDU (or LISTSERV@MITVMA.BITNET). Wouter van Ooijen's PIC (and other electronics) pages - JAL high level language for PICs and fast Ubicom (formerly Scenix) PIC clones. On one hand the Basic Language chips are easier to program for simple tasks for someone who's a new programmer, hence their acceptance in schools. But on the other hand they run much slower than the chip's machine code speed since they are interpreted languages and cost 10 to 50 times more than the raw uC chip. The manual for the Parallax Basic language is much much bigger than the few pages it takes to list the 35 assembly commands the mid range Microchip uCs support. On October 4, 1957 when the Russian Sputnik satellite was launched (they played the "beep -beep" sound over our high school PA system) some scientists found that it's orbit could be determined by knowing the location of the receiver on the Earth and using the doppler shift information. It became clear to John Hopkins University that if the orbit parameters were known then the position of the receiver on the Earth could be determined. Early Days of Sputnik - "...WWV 20-MHz standard broadcast was at nearly the Sputnik frequency, the output from the receiver could be made to be the audible difference between the WWV standard and the Sputnik signal. Superimposed was the WWV timing signal..."
This idea was bought by the U.S. military and the Transit navigation satellites were the result. Transit-1B launched 13 April 1960 (1A 17 Sep. 1959 failed to reach orbit). The Transit birds transmitted their orbit parameters on 150 MHz and 400 MHz. By using two frequencies the atmospheric effects on the signals can be removed. This system was used by submarines to reset their inertial navigation systems. The problem with the system was that the receivers needed an extremely accurate local clock and were therefore very expensive. FOr example the Magnavox MX 4102 has a 5 MHz OCO that's lab quality. Now the system is used for research and is called " Navy Ionospheric Monitoring System (NIMS)". When the Global Positioning System was being designed it was done to allow a low cost (simple crystal oscillator) clock to be used. In order for this to work GPS has four unknowns 3 position coordinates and time. A GPS receiver can have the capability of not only telling it's user where he is but also the precise time. I can set the my local clock to within about 30 nanoseconds by means of GPS. The early days of the GPS system showed that it was much more accurate than expected. After the KAL-007 airliner was shot down (it was using inertial navigation that was incorectly set) the Coarse Acquisition (CA) code was put into the public domain and Selective Availability (SA) was turned on. SA has the effect of degrading the accuracy of the CA signal. In 2000 SA was turned off. I have taught myself quite a lot about GPS by buying and learning from development systems. I found an EDO brand Canadian military surplus GPS set called R-5133/URN-502. EDO no longer appears to be in the GPS business. I have done some reverse engineering on it. Stanford Telecom 5001A Navstar Test Transmitter which I need to reverse engineer because so far I have not been able to get any data from STEL since they have gone out of the GPS business. the Garmin readings are within about 10 counts( about 36 feet) of what I think is the correct answer. In addition I have an extensive library of GPS books most I got from NavTech. My interest is both in the timing aspects and in surveying applications where carrier phase postprocessing can be used to get very good relative accuracy. Synergy (Tech Notes) is an official Motorola GPS reseller. TAPR has a PIC based board that takes in the Motorola Binary differential data and sends it out as an RTCM SC-104 Type 1 message. This can be used for differential corrections to improve the position accuracy of all GPS receivers that accept the RTCM SC-104 format signals. The standard for ship instrument to instrument communication is NMEA 0183. Most all GPS receivers output data in NMEA-0183 format as well as allowing the selection on a proprietarily format instead. Aquapac - waterproof bag for GPS, camera, etc. Peter Bennett's pages - NMEA 0183 & GPS - NMEA 0183 is a specification for both a physical interface (similar to RS-232) and for the content of data packets from a GPS receiver and other equipment on ships. Richard Bollar & Leesa Stephens - Garmin GPSIII Plus map setings - some ideas on how to get the III+ display to look like you want it to. NGS Data Sheet By Area - Data Sheets can be retrieved within a two mile radius of a given latitude and longitude. *** some of the above have changed their URLs from *.mil to *.gov, so if one is broke you might they that change. DGPS is a way to correct for a number of error sources by using a reference station and a rover. Most commonly done using a radio to send the DGPS correction data to the rover in real time such as for ship navigation in coastal waters (283.5 - 325 kHz). This requires recording information about the range and range rate for each satellite in view. The RTCM 104 specification covers the data format to transmit DGPS corrections. This is used by the U.S. Coast Guard DGPS stations. The great majority of DGPS is done in real time using only the C/A code signal. The accuracy after DGPS is around 5 meters. There are ways to do C/A code DGPS as a post processing operation. The WAAS system is a geosynchronous satellite system of providing differential corrections. In order to do postprocessing you need to convert the receiver output into RINEX2 format. Then OMNI software can be used. The receiver uses 2 DSP chips and looks almost exactly like the origional Trimble DGPS receiver, but they don't seem to offer it anymore. US Patent 6397147 Relative GPS positioning using a single GPS receiver with internally generated differential correction terms May 28, 2002 by CSI Wireless - uses this patent only in one of their WAAS receivers - note that any given satellite will only be visible for tens of minutes to a few hours. As satellites that were overhead when the differential corrections were generated start setting the corrections will degrade and when only 3 satellites are left will cease to have much value. This was built to test GPS equipment before the satellites were launched. My 5001A web page. A web page about the various Motorola GPS receivers. Post Processing refers to the idea of recording data from a roving GPS receiver and then at a later time processing that data to improve it's accuracy. There are a number of techniques of doing this. Land surveyors use carrier phase in addition to the C/A code and also use the L2 frequency without knowing the crypto key and can get centimeter accuracy relative to their base station. If the base station happens to be a USGS "monument" (or a base station that is known relative to a monument) then the accuracy is in the centimeter range. GPSPACE is a PC-compatible GPS point positioning program that provides DGPS accuracies without requiring access to base station data. You need to wait a few days after the survey. Cost CND$200 + CND$70/day. This paragraph started after I watched the 9 Nov 2006 presentation "Should Google Go Nuclear? Clean, cheap, nuclear power (no, really)" by Robert Bussard given to people at Google. As far as I can tell this is for real. His Navy funding has run out. The power output goes up as the 7th power of the size so that very high outputs should be available from machines a few meters in size. The reaction has no radioactive products when it's shut off. The plasma is contained in a spherical shape using magnetic fields. Fusor.net posting "Inertial Electrostatic Fusion systems can now be built" - note that Bussard's company Energy Matter Conversion Corporation (EMC2) was working on improving the Farnsworth Fusion reactor. *Patents 4363775 & 4836972 were abandoned in pat 5174945. These may be deal breakers or they may be someting that can be overcome. 3778343 (pdf) Device for Plasma Confinement and Heating by High Currents and Nonclassical Plasma Transport Properties, Dec 11, 1973, Coppi et al, 376/123 ; 376/133 - Tokamak type fusion reactor - the type currently being developed by the U.S. AEC, billions of dollars being spent. 3258402 (pdf) Electronic Discharge Device for Producing Interactions between Nuclei, P T Farnsworth, Jun 28, 1966 376/107 ; 376/105; 376/120; 376/145; 376/146 - Bussard says the grid will always be too dense and capture particles that need to be free. He replaces the electrostatic grid with a magnetic field. The trick is to use a geometry such that there's a even number of vertices so that the North and South poles can be balanced. 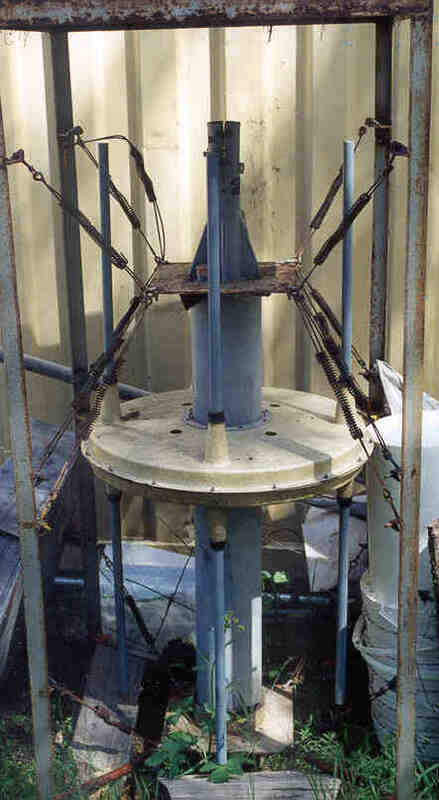 3530497 (pdf) Apparatus for Generating Fusion Reactions, Hirsch et al, Sep 22, 1970, 376/107 ; 376/145; 976/DIG.4 - uses electrostatic containment and a grid like the Farnsworth apparatus. Ready to Use Batteries - are a good match with the Windbelt since they don't go flat like a Ni-MH or Ni-Cad. Used military and commercial electronics equipment sometimes is a very good deal. I have some of it. Montrael, Canada It is made to go on top of a mast with a 2" O.D. It has 4 each vertical dipoles 50" end to end that are in a square pattern 14" on a side. A Type-N connector and a male 10-pin military connector. There is a lamp at the top that I think is a 110 Volt unit. Levy/Latham Global LLC - Official Surplus Seller for DRMS starting Oct. 98 - As of 17 Oct. they don't have anything in FSC 5820. This is the time this page has been accessed since 21 Jan. 2000.